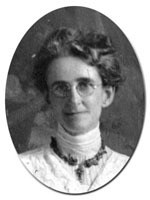 Margaret Grace Whittemore was an extension worker in the College of Home Economics. She attended Teachers College, Columbia University from 1905 to 1907 and obtained her B.S. there. She returned in 1919, and received her M.A. in 1920. Whittemore specialized in home economics education and came to Cornell with fifteen years of teaching experience. At Cornell she specialized in junior extension work in home economics.